Now you can get a pink, or any color cricut here too. I hope to have a full blog layout using the cricut up sometime next week for purchase. Now you can have any color cricut you want, well in cyberspace that is. My r-l cricut is black. I think a blog cricut is a must for every die hard cricut fan. So what color will your cyberspace cricut be? Thank you to Miss Maria from b3boutique for awarding it to me. I appreciate it so much, especially since I always feel like I am still talking to myself. give this award to 10 awesome bloggers. In 10 years where would I like to be.....Well I am not going to lie my life right now isn't too shabby. I am married to a wonderful man and I have 4 beautiful, healthy, happy children. I get up everyday go to my computer to draw, play and create fun stuff on the computer which in return people give me money for this service. You know I have chatted with some of the people who's blog I listed, however there are some blogs on the listed that I have never said anything to and they probably didn't even know how much I enjoyed their blog. What a nice award. Thanks Maria, who I do definitely know, for giving me this award. It was SO NICE of you to think of me and give it to me so I could give it to some other blogs that I think are delightful and intriguing. The lucky number in the Blog Make-Over is........#9. The number #9 comment belongs to............ LAINEY!!! Yeah Lainey!!! I will work with Lainey to create a blog she will love. Come back soon and check out Lainey's New Look! 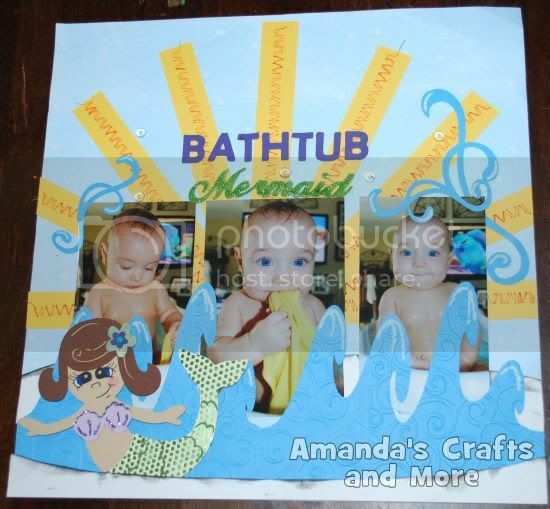 I recently had a chance to work with Amanda from Amanda's Crafts and More on her blog. While working with her I discovered that she downloaded and used my little mermaid in her layout. I am so excited!! I hadn't seen any of my little creations in other's layout before, only my own. If you have time pop over to Amanda's Blog because she is super talented and lots of pretty layouts and creations to ooohhh and aaahhh over. Here is a link to the original mermaid post so you can use it yourself if you want. Need a new blog look? Want a cute blog but a little overwhelmed where to start? Well enter the DtsArt Blog Makeover RAK. It couldn't be simpler to enter. Post a comment on this thread and on or about March 15, 2010 I will pick a random winner, via random.org, to give a blog makeover to. If you grabbed my blog button it would be appreciated but is not necessary to win. I will discuss with you your likes and dislikes and work with you to come up with a cute blog look for you. If you want an idea of my work feel free to visit my website and look around under auction templates. You will see that I have worked with large selection of themes. Blog makeover is limited to those that use Blogger.com to host their blog. Blog makeover will include an active copyright link to http://www.dtsart.com/. I have had some request asking me how to make a blog button so here it is. I have started the basic button in case you are just comfortable with just adding your blog name to the button. If you want to use one of the buttons posted as a base just mouse over it and right click and save. If you use a button from above you can skip to step 5 or 6. Let's Get Started. 1. You will need some kind of image editing program. It doesn't matter which program. Open it up. 2. Open a new file canvas size 125x 125 pixels with a resolution of 72. 3. Pick a color for your background and flood fill the canvas with the color of your choice. 5. If you have clip art you would like to use place in on your button now. Not too big as you will need to be able to write your blog name on it. 6. Write your blog name in the color of your choice using the text too. 8. Now upload your blog button to an image host. You can search free image host in your favorite search engine. I personally use Photobucket. 9. Once you have the blog button uploaded to your photo host you will need to get the image url. Your photo host will generate this for you. 10. Now you will need to put your image url and blog address in the code provided and put the code on your blog. If you need instructions on how to add the code to your blog, they are here. If you can't figure out how to make a blog button and you want one. You can purchase a blog grab, you can see examples of size and animated blog buttons here too!